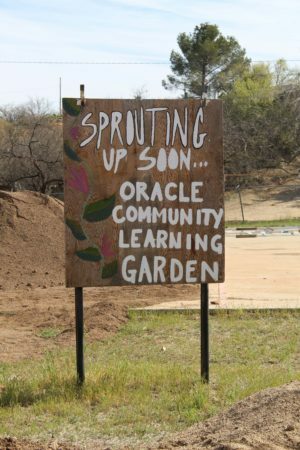 More than 40 people attended the Oracle Community Learning Garden at Wood’s Field meeting on Sunday, March 18, 2018. At the meeting, Jim Pollack’s rendering of a master plan concept for the garden was displayed along with pictures and drawings of proposed ideas for the garden. On Saturday, March 24, members of the Oracle Community Learning Garden visited different gardens in Oracle to get new ideas and inspiration. On Saturday, March 31, there was a Seed Sowing Bee. Attendees learned how to successfully grow plants from seed. All materials were provided including seeds.